Edge restraints secure the hardscape system and are a necessity in any hardscape project installation if you want it to look beautiful through the years. To avoid the high cost of paver edge restraint failure and ultimately protect your reputation, carefully consider the many factors that affect the edge restraint’s performance over the lifetime of a paver project. Quality makes the difference! Snap Edge® and Low Profile have all the features that strongly secure the interlocking pavement system and will keep it looking beautiful through the years! Strong interlocking joint held together with a spike to make a secure connection and provide extra support. Our unique “One-Cut Snip & Flex” feature allows total freedom when designing your driveway or sidewalk. You can create unlimited curves and angles in minutes, ensuring an aesthetically pleasing and structurally superior project. This flexibility and strength has made Snap Edge® the premier edging choice of professionals. Visit the Snap Edge® Low Profile page for details. PICP (Permeable Interlocking Concrete Pavement) Permeable paving is a range of sustainable materials and techniques for permeable pavements with a base and sub-base that allow the movement of stormwater through the surface. In addition to reducing runoff, this effectively traps suspended solids and filters pollutants from the water. 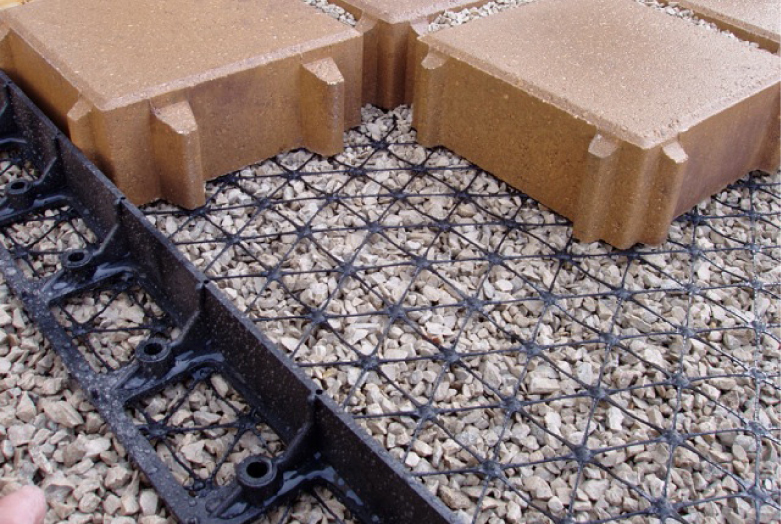 Geogrid anchor is permanently attached to the SnapEdge™ paver restraint and Installs on top of the stone chip setting bed. Visit the Perm EdgeTM for details.